Ace Music Director Devi Sri Prasad Aka 'rockstar' Dsp, Is All Set To Take His Fans In Australia And New Zealand By Storm Later This Year. After The Stupendous Success Of His Usa Tour, Dsp Is All Set To Perform Live In Several Cities Across Australia And New Zealand, For The First Time Ever, Starting From The Last Week Of May And Continuing To June This Year. The Event Is Going To Be Organised By Kk Productions From Australia. Last Year In August, 2016, Zee Telugu Bought The Exclusive Rights Of Dsp's Live In Concert In Usa And He Organised A First-of-its-kind "Dsp Usa Tour World Premiere Event" To Showcase The Phenomenal Response That He Received In Usa. Several Dignitaries From The Film Industry Including Chiranjeevi, Prabhu Deva, Allu Aravind, Allu Arjun, Rakul Preet, Lavanya Tripati, Naga Chaitanya, Akhil, Sukumar, Vamshi Paidipally, Harish Shankar And Several Others Graced The Ceremony. It Was One Of The Biggest Events In Tollywood And The Show Garnered A Huge Response On Tv And Internet Alike. Post The Success Of Janatha Garage And Khaidi No 150, Dsp's Popularity Is At An All-time High And The Music Director Has Ensured That Every Album Of His Turns Out To Be A Chartbuster. This Year, As He Gears Up To Enthrall Music Lovers With Films Like Duvvada Jagannadham, Ram Charan-sukumar's Film, Mahesh Babu-koratala Siva's Film And Ntr-bobby's Film, He Has Something Even More Special For His Fans In Australia And New Zealand. Get Ready To Rock And Roll, And Groove To Dsp's Foot-tapping Songs, Performed By The Man Himself, Along With His Team. 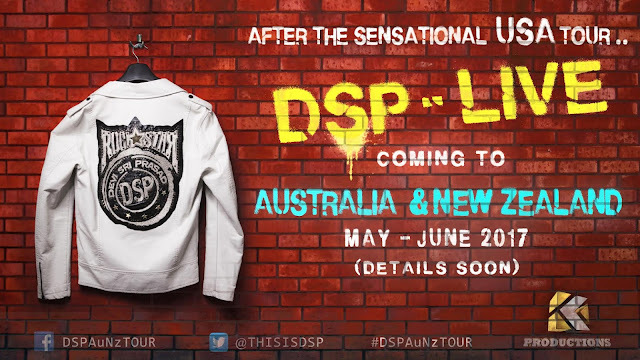 Here's A Very Innovative Announcement Poster Of Dsp's Australia & New Zealand Tour. More Details Will Be Announced Soon In The Next Poster!! !